I slept in until 10:45 AM on Monday and I felt like going back to bed after eating breakfast. I still had the cold and I still felt like crap. I worked on the post, got my stuff together, and left Victoria’s and my apartment in Madison at 3:15. I stopped in Lake Mills to pick up a sub from Jimmy Johns and then continued on to Milwaukee. I was parked at 4:50 and I spent the next hour walking around the parking lots and telling people about Be The Match and why it’s important to grow the registry. 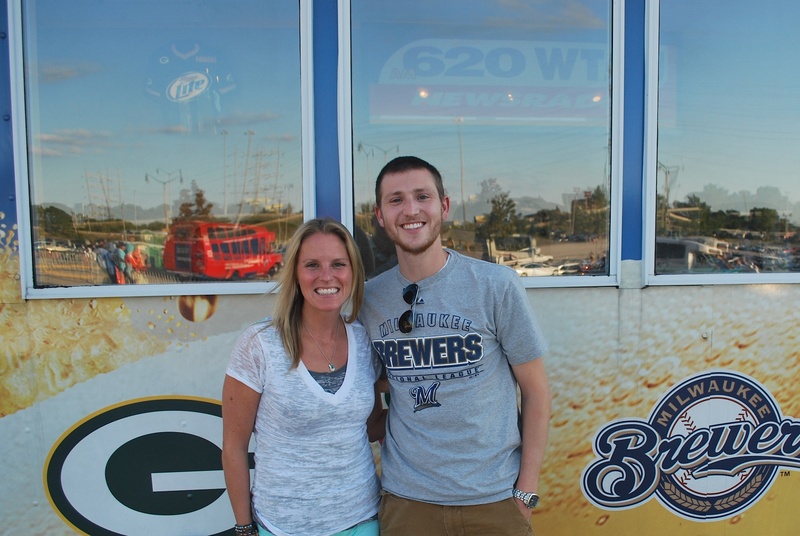 At 5:55 I headed to the 620 WTMJ tailgater that’s located near the home plate entrance. Trenni Kusnierek had invited me on the show, and I joined her and Greg Matzek on air around 6:20. They asked questions and I answered them, talking about my journey thus far as well as Be The Match. Before parting ways Greg took a picture of Trenni and me. After talking with Trenni for a few minutes I dropped my twitter follower’s ticket off at will call and went inside. 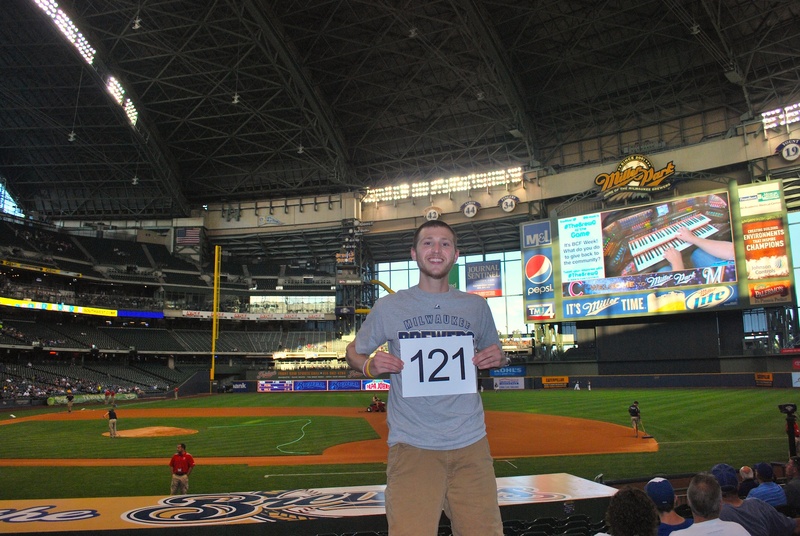 Section 113 was the spot for game photo number 121. I had a nearby fan take the picture for me and I found out later her name is Brandy, or Brandi, or however she spells it. She was on the jumbotron answering a trivia question early in the game, and they said her name. Thanks Brandy! 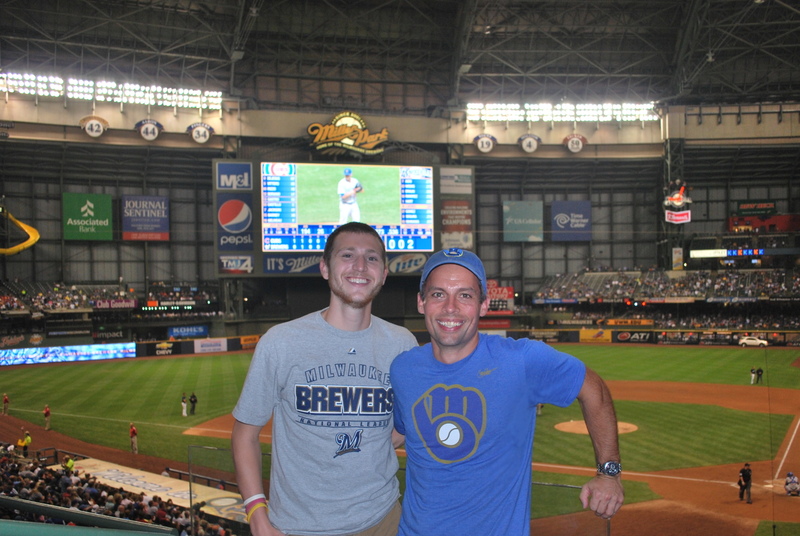 My twitter follower, Adam, joined me shortly before the game started and the Cubs took a 1-0 lead in the 1st. A sacrifice fly in the top of the 2nd doubled their lead. 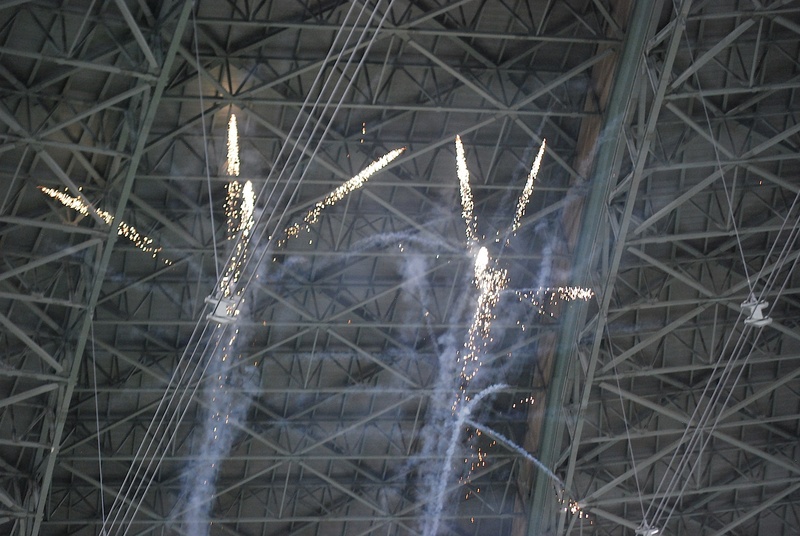 Lucroy cut the lead in half when he hit a solo home run in the bottom of the 2nd. In the 5th inning the Cubs increased their lead back to two runs. The Brewers had an answer in the bottom of the 5th, eight answers to be exact. Eleven batters came to the plate in the 5th. Technically 9 different batters as two of them batted twice. Gomez led off with a single and scored on a one-out Travis Ishikawa base hit. Aoki drove in Ishikawa with a sacrifice fly and there were now two outs and no one on base. 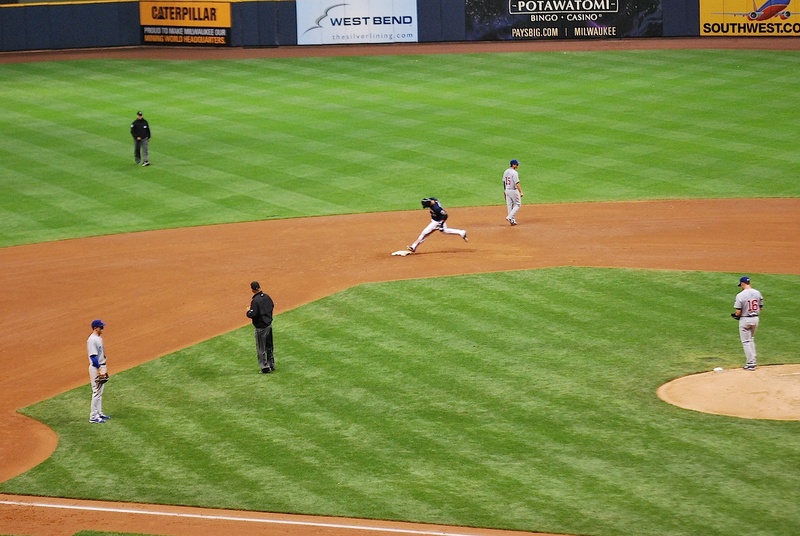 Weeks and Braun both singled and Ramirez walked, loading the bases for Corey Hart. 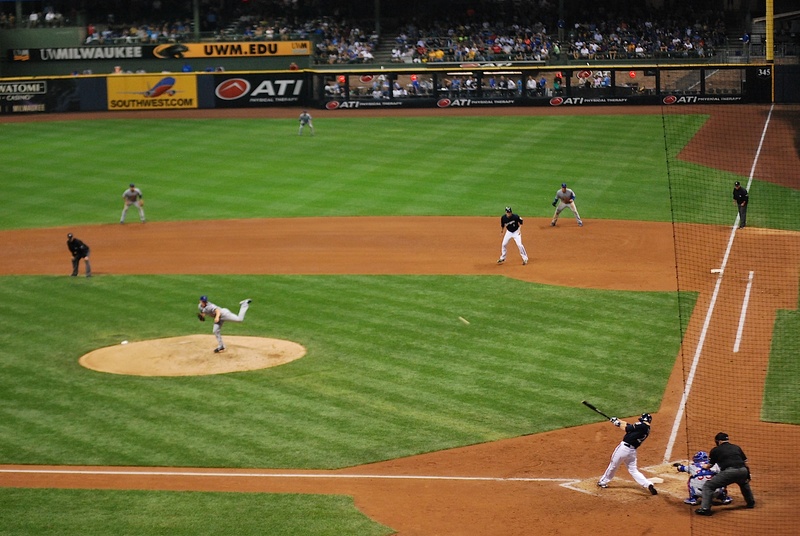 It wasn’t a grand slam like Thursday, but it was a 2-run single and the Brewers had a 5-3 lead. The Cubs’ starter, Justin Germano, got the hook, and while the pitching change went down I had a fan a few rows in front of us take a picture of me and Adam. He donated $50 to Be The Match for his ticket which brings us close to $3,500 raised so far. Thanks Adam! And thank you everyone for your donations and your support. Germano’s replacement, Jeff Beliveau, didn’t fare much better. The first batter he faced was Jonathan Lucroy, who duplicated his 2nd inning performance with another home run, this time a 3-run shot. 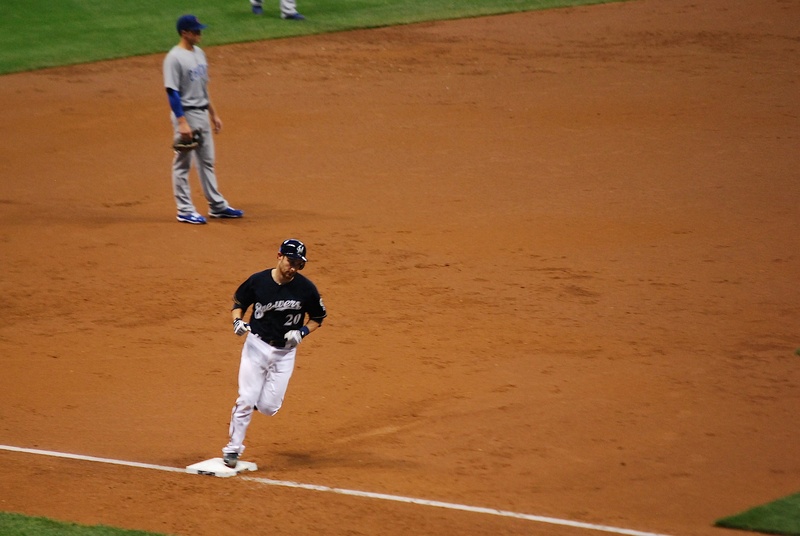 Gomez wanted in on the action and followed Lucroy with a blast of his own. I’m not sure which was faster, the ball getting out of the park or Go-Go racing around the bases. 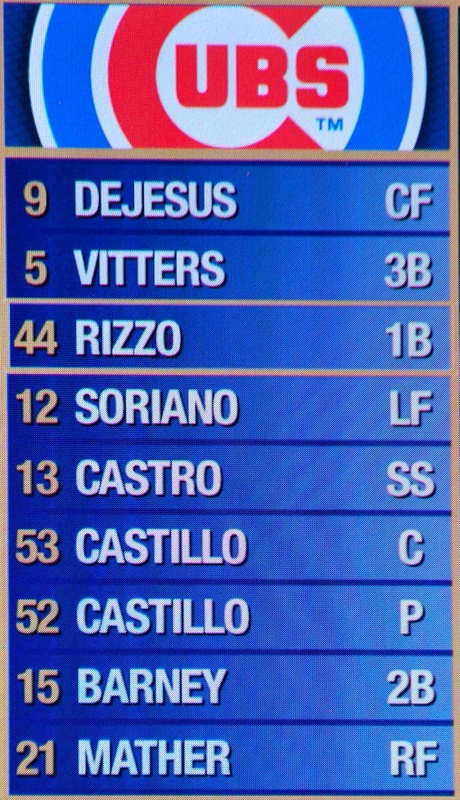 In the bottom of the 6th the Cubs brought in Lendy Castillo and the Cubs lineup looked like this. The classic Castillo-Castillo battery, and they sported consecutive jersey numbers, awwww….. In the 7th the Cubs got a solo run on an RBI-groundout and in the 9th a wild pitch by Livan Hernandez allowed another run to score. 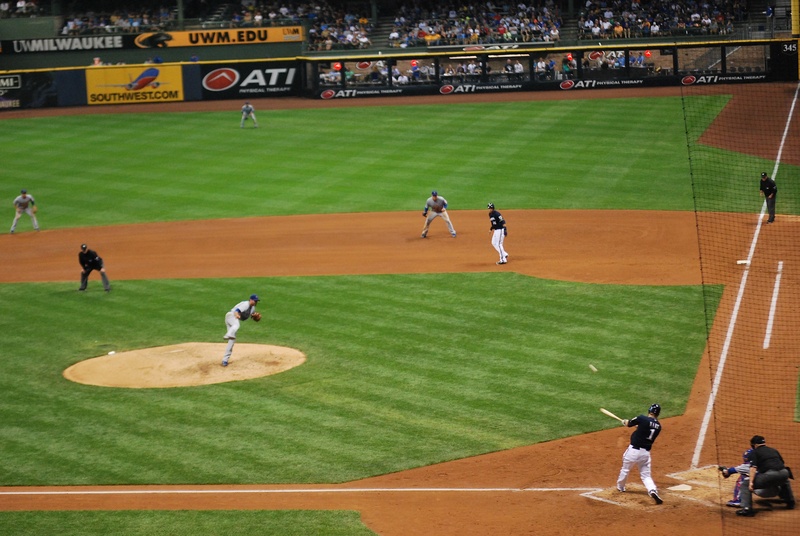 The 8-run inning proved the difference and the Brewers won going away. Final Score: Brewers 9 – Cubs 5. I took this picture before the wild pitch and the 5th run for the Cubs, but you get the picture. That snowman in the 5th sure looks nice. I believe it’s the most runs the Brewers have put up in a single inning this year. Since I’ve been to every game you’d think I would know that, but I’ve witnessed a lot of baseball and games start running together and details get forgotten. It’s 1:40 on Tuesday afternoon and I’ll be leaving in an hour and a half for the second game of the series. I’m sitting in Front Row Amy’s seat tonight, so look for me behind the plate. I’ll be holding up the game number sign at various times, only when the Brewers are batting though. I don’t want to be a distraction for Marco Estrada or the guys in the field. I couldn’t find anybody to buy my tickets in section 221 yet, so I’ll be trying to scalp them for a donation to Be The Match before the game tonight. Last time I tried doing that the other scalpers swooped in when I had a potential buyer. I’m hoping there’s none of that funny business today.